As a rental property owner, you might be curious what a vacancy will cost you. Vacancies are part of owning rentals and these periods can make or break you depending on your financial capacity. There are many ways in which it will affect your rental income. Calculating the cost of vacancy (COV) is critical before buying any rental property in the Atlanta area. You will inevitably have a vacant property at one point or another, and it is wise to be financially prepared for it. 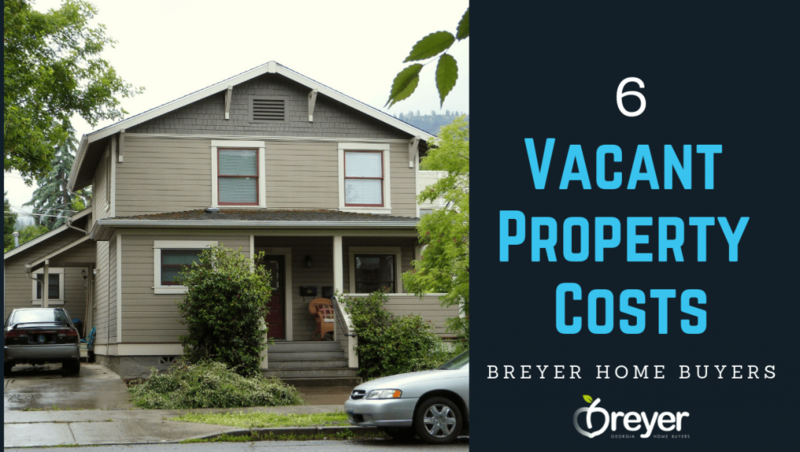 Think about all of the ways owning a vacant property will cost you. It isn’t just the lost income, but also the expenses you will need to cover that your tenant would usually be taking care of. The biggest hit you will take is the obvious loss of rental property income. If you have a mortgage on the property, and typically rely on your tenant’s rent payment, you will need to be sure you will be able to make the payments while the property is empty. You don’t want to default on the loan or begin missing payments because your tenant suddenly moved out. Have a plan in place to pay the mortgage and get a new tenant in there quickly. If you are trying to get new tenants in the door, you will need to have the lights on so they can see the place. It is likely your tenants paid these costs in the past, but paying the utilities are now your responsibility during the transition. In addition to your own set of monthly bills, you will now need to take on the water and power expenses for a vacant property. Luckily, with nobody in the house, your bills shouldn’t be too high. Obviously, you will want to get the place rented out quickly, which will require you to get the word out about its availability. Running ads online, taking quality photos of the place and creating virtual tours of the property will all add up. Keep this in mind when you are calculating how much a vacancy is going to cost you. Screening new tenants is another fairly large expense you will have to deal with. Background checks, credit checks and reviewing it all will take you a considerable amount of time and money. However, this isn’t something you will want to skimp on. Having bad tenants in the house will cost you more than a short-term vacancy ever could. The process of dealing with a vacant property, advertising and screening new tenants can be extremely time-consuming. This is the time you could be spending on other things. Your job, your family and your free time are all very important. There is nothing better than having your rental property occupied by a high-quality and respectful tenant. Ideally, you will want someone who can stay long term. To keep a tenant in place for a while means you have to do your part by being a good landlord. They have to want to continue living there. Take care of all maintenance issues as needed and splurge on an upgrade or two as needed to increase the value, or perceived value, or the property. If the home sells for $100,000 and the mortgage balance at that time is $60,000, after paying $10,000 in closing costs and commissions, there is $30,000 in equity. But if it costs $1,000/month to hold the house, this equity disappears in just 30 months. Even after just 12 months, the equity is down $12,000 (assuming prices stay flat), and it’s not uncommon to see homes that have been vacant that long.